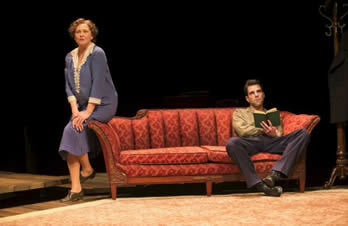 In his opening monologue, Tom, the narrator of The Glass Menagerie, explains that “the play is memory” and the American Repertory Theater's (ART) current production of Tennessee Williams's masterpiece, directed by John Tiffany, fully realizes the concept of a “memory play.” The devotion to creating a play that indeed feels like a memory is evident in every element of the production, from the casting and acting to the set and lighting design. From the moment that the house lights fall and Tom takes the stage the audience is transported to a magical place that wavers on the edge of reality and fantasy as memories so often do. Because a memory is an account of the past told in retrospect, the tone of Tom's narrative is a combination of fond recollection, detachment, and regret. Tom tells the story of his life in a St. Louis tenement with his mother Amanda and sister Laura. Cherry Jones, a founding member of ART, plays Amanda, whose own memories of her youth as a well-to-do Southern Belle contribute to the layers of memory that drive the play. It is through the stories of her own gentleman callers that Amanda hopes to excite in her daughter the desire for a suitor of her own. Laura, played by Celia Keenan-Bolger, is a strange, shy young woman, afflicted with a physical disability that causes her to limp. The shame she felt in high school at wearing a brace on her leg has, over time, caused her to withdraw from the world. After dropping out of high school and recently vocational school, Laura spends her days shut away in the tenement playing records on her phonograph and attending to her collection of tiny glass animals. As Laura's interest in pursuing a normal life fades, Amanda becomes desperate to find her a gentleman caller. Tom, played by Zachary Quinto, works in a factory to support his mother and sister, yet longs to escape the confines of this world. Stifled by life at home, Tom spends his nights “at the movies,” or so he tells his mother. Reflecting the theme of memory, each character, in his or her own way, is only half present in reality. Amanda clings to her memories of a more glamorous life. Laura prefers to live in a fantasy world of music and dancing rainbow reflections than to face the painful realities of her life. And Tom recedes into the shadows of the night where he can partake in a world where neither the expectations of his overbearing mother nor his longing to protect his delicate sister can reach him. 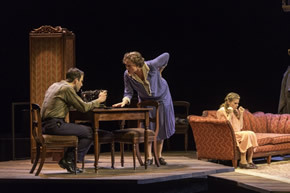 The set and lighting design (sets and costumes by Bob Crowley, lights by Natasha Katz) masterfully evoke the feeling of memory. The world on stage is both fragmented and vivid. The central playing area is the interior of the tenement, specifically a dining room and living room. The set design reflects the qualities of memory in that every object on the stage has specific symbolic meaning to Tom, and as the story unfolds we see that each object exists in this world because its meaning has kept it vivid in Tom's memory. The phonograph and menagerie symbolize his memory of his sister, while the telephone remains a symbol of Tom's absent father. The coat stand, although less explicitly symbolic, is where Tom reaches every time he is driven to leave the apartment. It is his touchstone for escape. From it he takes his black coat and hat and escapes into the night. The dining room table represents Tom's mother. This is classically a place where family comes together, and in this way we can see it as a symbol of Tom's memory of Amanda, desperately trying to hold her family together. The perimeter of the set is fragmented and resembles the way that important memories sometimes omit details and skew perspective. A fire escape serves as the entrance to the apartment from below the stage. From the stage level it extends upward all the way to the ceiling of the theater, growing smaller and less realistic as it ascends. So although it serves a practical purpose on the stage level, the fire escape's seemingly endless extension in both directions creates the feeling that the tenement is suspended in space, existing only on a single step in the staircase of Tom's timeline. The fire escape is the only scenic element outside the apartment that is lit. The background is empty and dark and this darkness is mirrored in the pools of water that surround the playing space. This design choice supports the memory frame too. The glassy surface of the water reflects the actors and the lit portion of the stage and plays on the idea of reflection as it pertains to illusion and memory. Surrounded by darkness above and below, the lit world of the tenement floats like a strangely familiar portrait. The colors of the set in contrast to the black background add to this feeling. The interior of the apartment is mostly light shades of blues and pinks. Whimsical yet fading, they resemble the colors that glass casts when light is reflected through it. Indeed, the apartment is lit to be reflected in the surrounding pools of water, blurring reality and illusion. It is no easy task for an actor to create a character that is both believable and based on the idea of a memory; however, with evident trust in the text and a commitment to subtlety and grace, this cast achieves this lofty goal. Each actor brings a unique quality to the performance that complements and supports the others, creating a truly believable family dynamic. Especially relevant to the idea of creating a memory play for the actor are tone and physicality. Each actor captures the inner psychology of his or her character through tone and movement. At the same time they ardently adhere to the convention that they are being viewed through the lens of Tom's memory. This creates a beautiful juxtaposition between exaggeration and subtlety. The character of Amanda is a prime example. While Ms. Jones's motherly tone leaves no doubt that she wants the best for her children, her voice also conveys regret and bitterness. The ever-present tugging of past regrets, in combination with her powerful voice and large sweeping gestures, show both the realities of who Amanda is and the way her son chooses to remember her. The role of Tom is unique because he exists both in the present, as he speaks to the audience, and in the past of which he speaks. Zachary Quinto's task is to shed light on the strange and difficult experience of remembering his own life, while simultaneously existing truthfully for the audience inside his story. Accordingly, Mr. Quinto's performance is like a dance, moving back and forth between the stifled, tortured Tom of his past and the thoughtful yet detached narrator who speaks to the audience. The narrator speaks with all the wisdom one gains in retrospect, while the character lives out the painful and harsh experiences that led him to that place. We see this duality appear over and over in this production, reflected beautifully in Mr. Quinto's performance. In the second act, Laura finally receives a “gentleman caller.” Jim, played by Brian J. Smith, is a friend of Tom's from the factory. Although he too is part of Tom's memory, Jim is truly a guest in this family's world. In Tom's memory he represents the outside world; Jim lives in an entirely different reality. He also marks the end of a chapter in Tom's life, because shortly after his visit Tom finally left home. Therefore, the quality that Mr. Smith brings to the stage is much more grounded and natural than the others. His tone is cheerful and matter of fact. His movements reflect his confidence and contentment. The long scene between Jim and Laura that makes up most of the second act reveals the character of Laura. In contrast to Jim, we see how far removed she has become from reality. In his presence, however, we see a side to her that she has thus far kept hidden. The quality of this scene is different from the rest of the play. In Tom's absence the characters become momentarily more real. At the same time, the theme of memory is not lost. The tender connection that develops between Jim and Laura is built upon their shared memories of high school. Ms. Keenan-Bolger and Mr. Smith compliment each other well. Their performances contain all the awkwardness of two adults being set up, while at the same time realizing that there is an unlikely connection. Ms. Keenan-Bolger's tone changes as she speaks to Jim. As Laura dares to open up in hopes of winning Jim's affections, her voice slowly becomes stronger and more sure, losing the previous timidness and anxiety. We see that she is funny and intelligent. There is a tender moment as Jim kisses her when Laura's hope is tangible to the audience. Yet the magic of this moment is shattered a second later. As Jim returns to reality and explains to Laura that he is in fact engaged, Laura returns to fantasy where she can hold on to the previous moment and forget the reality of the present one. Ms. Keenan-Bolger vividly captures Laura's disappointment. Her expression becomes distant and her limp amplified, and we get a sense that she may be retreating from reality for the last time. It seems that it is the shattering of hope that occurs in this final scene that drives Tom to finally take leave of that world forever. This scene is so different from the rest of the play because in Tom's memory it is more real and bold, marking a moment when the course of his life changed. This play touches on a multitude of issues, from personal identity and family dynamics to the fragile nature of memory, feeling and illusion. The broadness of topic again speaks to the overarching theme of memory. For me, it evoked both laughter and tears as I thought about the nature of my own memories. I laughed at the moments where Amanda's parenting techniques were all too familiar or when it seemed clear that something was exaggerated or distorted because of Tom's attitude towards the memory. Sadness welled inside me as I recalled my own struggle to discover my identity and separate that from the expectations of my family. And I felt a mixture of both humor and sadness as I realized that certain perspectives and truths about life choices can only be realized in retrospect. The play's efficacy as a memory play is evident in the feeling it evokes in the audience. I left the theater feeling as though I had witnessed something magical and not altogether real. I felt a sense of privilege similar to the feeling of a new friend trusting me enough to tell me about his past. The success of the play is in large part due to the evident devotion of the entire production team to honor Williams's masterpiece. Although the interpretation of the play was new and unique, it subtly showed a deep trust of the text to convey the timeless essence of this story. “The play is memory,” echoes for me as the truest comment in the production. It is in fact a memory, and its impact on the mind of the audience lingers; just when it seems as though it might have faded, something glimmers and brings it back into focus.